Happy Monday, Everyone! I hope you had a lovely weekend! We certainly did. On Saturday my niece held a kitty adoption party for her daughter who just turned 6 years old. Would you like to see some adorable birthday party inspiration? This year they decided on a Kitty Adoption theme for Evy’s 6th birthday party. 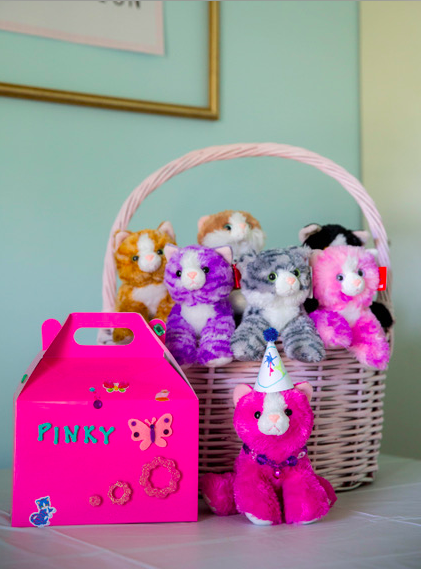 Angel, her talented Mom, put together the most creative and adorable birthday party ever! I should add that not only is my niece, Angel, a terrific Mother, but is a professional photographer and baker extraordinaire! Just take a look at the party pictures and details she shared with me! Angel made her signature chocolate cupcakes with chocolate icing. I shared her recipe a few weeks ago and they are truly amazing! You can find the recipe here: The Most Amazing Chocolate Cake Recipe For the kitty cupcakes she used candy for the eyes and noses and cut miniature marshmallows for the ears. How adorable! And delicious!! These darling little kitty ear head bands were purchased from Target and were a party favor for each guest. Pictured below is Evy, (on the right) with her bestie Eden, both wearing their kitty ears. Evy’s darling dress was purchased at Target. Little blonde beauties! Also, Evy is one of the flower girls in my son’s upcoming wedding. She said it had been a life long dream to be a flower girl. I guess in November she can check that off of her bucket list at age 6. So precocious! The napkins, tablecloth, kitty plates and banners were purchased from EzPartyZone.com. Angel said their prices were the best and she was impressed with how quickly her order arrived. I love how Angel decorated the wall behind the table with strips of twisted crepe paper in shades of pink and blue. It was the perfect backdrop to the kitty and happy birthday banners! Here is the official Kitty Adoption Station where each party guest got to pick out hers or his kitty. The kitties were purchased from StuffedSafari.com. Again, Angel was impressed by their prompt delivery and excellent customer service. The pink and blue gable boxes below were purchased on Amazon. They cut openings on the front of each one to create a kitty carrier/crate. I’m so impressed with the organization and creativity of everything. I think this is the cutest children’s party ever! Angel purchased stick on foam letters and assorted stickers and jewels from Hobby Lobby to decorate the kitty carriers. The children could name their kitten and put the name on their gable box. She said this was by far the favorite activity! You can see how much the children enjoyed decorating their kitty carriers! And what a great idea to use stickers with self adhesive backing. No messy glue or glue sticks! And here’s the adorable birthday girl, Evy decorating her kitty carrier. Naturally she chose pink! Isn’t this such a cute idea? And if kittens aren’t your child’s thing, you could always do a puppy adoption party! Here’s a little party guest getting a hand from her Mother. I love this age. So serious. Angel created Certificates of Adoption to make it official. She purchased these cute kitty markers at Target so each new Mommy or Daddy could sign the adoption papers. Another clever party activity was pin the tail on the kitty. Angel created the kitty board and made three different shaped tails so each child could color and sign their name, then pin the tail on the kitty. Here’s the birthday girl taking her turn at pin the tail on the kitty game. Notice she doesn’t dare set down her newly adopted kitten? And I love that mask! And here’s the kitty after the game is finished! This will be a fun keepsake for Evy. It looks like a piece of pop art! Here is one of the happily adopted kitties. She’s all decked out in her new beaded collar and fancy pet carrier! A few of the kitties…. Even the little boys at the party enjoyed the activities! So cute!! And one very happy birthday girl! Happy Birthday, Evy! We love you!! A huge thank you to my ultra sweet and talented niece, Angel Joyce, for sharing these wonderful pictures with me so I could share them with you! All photography credit goes to Angel. Somehow in the midst of hosting a party, she managed to capture these precious moments. I think we can all agree that she should add “Party Planner” to her long list of skills!